Mango is one of the most cherished fruits in Asia, especially in its south east region. It is basically a summery fruit and hence people use it to make various dishes in summer apart from enjoying its milkshake or eating it as it is. This mouth-watering fruit is also used to make salads and Mango Salad with Ginger Carrot Dressing is one such dish. It comprises of numerous ingredients like sesame oil, seeds, fresh ginger, lime juice, baby greens and rice vinegar along with mango. When all these ingredients are blended together they produce a wonderful taste which makes Mesclun and Mango Salad with Ginger Carrot Dressing a great dish to have on a hot summer day, when you are craving for something to energize you. The addition of dressing on Mesclun and Mango Salad with Ginger Carrot Dressing gives an Asian twist, which makes it different from the rest. You can prepare it in less than half an hour by following the steps given in this guide for your assistance. So you try Mesclun and Mango Salad with Ginger Carrot Dressing in your kitchen and serve it to your guests with as a dazzling smile on your lips as delicious the salad is. Take a small bowl and combine sesame oil, carrot, rice vinegar, ginger along with lime juice in it. After mixing the aforementioned ingredients, grab a medium sized bowl and place mango along with baby greens in it. Then, pour in the rice vinegar mixture created in Step 1. Mix all of them properly. Once the mixing is complete then take sesame seeds and sprinkle them over to garnish. 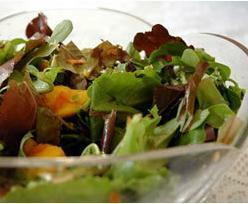 Your Mesclun and Mango Salad with Ginger Carrot Dressing is ready to be served at once.